Two years ago today, I was a freaking mess. I was frantically running around my place, packing, baking, photographing and writing my very first blog post. That afternoon I was driving down from LA to Temecula for the first Big Traveling Potluck and my first convention as a food blogger, a real food blogger. I had a big two posts and a tupperware container filled with cookies for the potluck. I had been talking about and planning to start this blog for months, possibly years before 2013, but the Potluck was the thing that helped sit me down and make it happen. I didn’t want to feel like a fraud, going to a food blogger conference without a blog (which I later learned, isn’t as big of a deal as I had dreamed it up to be). So I posted the recipe I was bringing there and it began. I had no idea, pushing the Publish button two years ago just what becoming a food blogger would have in store for me. I’ve met some truly amazing people, made wonderful friends, and found a community of people who just get it. Who understand the need to just a smell an ingredient, to wander up and down and up and down the closed streets of a farmer’s market, to ask important questions about food. I also had no idea about the incredible silence that surrounds you as a baby blogger. The silence you live in as you keep plugging forward toward recognition and connection with others. For the longest time I hated it. I so desperately wanted to hear a response from my call into the vast canyon of the internet, to know that someone I didn’t know would answer back. But, as I’ve kept creating and moving forward, I’ve come to accept and embrace the silence. And sometimes, a small voice cuts through the silence, amazing and invigorating me. Someone is out there. I must go on. I’ve also grown so much as a blogger and a person in the past two years. As time passes here, I’ve noticed there’s so much more I want to share with you. More recipes, more food, more about me and why I’m here, why I love food and cooking so much. In the coming weeks I will definitely sharing more of that with you. To celebrate the blog turning two, I wanted to celebrate with a small treat, and the timing of the strawberry Nutrition DL was perfect. Fruit crumbles are one of favorite desserts. Not only can they be packed with any delicious fruit you can think of, they’re so incredibly easy to make! No dough or mixers required. Just a knife, bowls and your hands. Also, if you decide to make individual crumbles rather than a baking dish full, the baking times and temperatures are the same. Making a crumble gluten free, vegan or without white sugar is a lot more straightforward than other baked goods. Nothing has to rise or really need gluten here. Easy, easy, easy. You’ll notice in the ingredient list that I used arrowroot powder. Arrowroot powder is a ground up tuber that naturally thickens up liquid. It’s an alternative to corn starch and doesn’t really taste like anything. In a world covered in corn, I’m good with giving arrowroot a try. 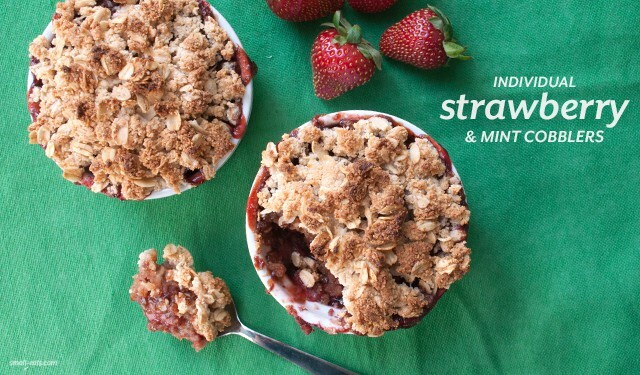 I added mint to this recipe to add a twist to your straightforward strawberry crumble. The clean, fresh taste pairs well with the strawberries, and is even better when the crumble is cold. If it can stay in your fridge that long. In a mixing bowl, combine all strawberry filling ingredients and stir until throughly mixed. In another bowl, combine all crumble topping ingredients and stir together, with a spoon or with your hands. Evenly divide the strawberry filling between two ramekins. Top each ramekin with the crumble topping and place ramekins on a foil-lined baking dish. Bake for 30-25 minutes in the middle rack of your oven, or until crumble is golden brown. Allow to cool before serving. Recipe adapted from Alton Brown and Unconventional Baker. hey “little” voice talking in the dark – someone does hear you. Congrats on your anniversary of starting your blog. i love crumbles as well so will give this a try when strawberry season arrives here. Thank you Jacquie! I appreciate hearing another voice out there. This sounds amazing & I love that it’s gluten free. Can’t wait to try it!